I went to the Descanso Garden this morning and looked at my favorite roses and the Earth Day displays they had around the garden. When I was first imagining this post, I thought I would feature a watercolor of roses from that rose garden. But while chatting with a fellow marcher yesterday I decided it would be good to commemorate the March for Science in Pasadena somehow and I was glad I’d brought some drawing materials with me. I hadn’t planned to do that, and only grabbed my pens, pencils, small pad of paper and sheet of bubble wrap (to sit on of course) as I ran out the door. I did this sketch when we all got to Memorial Park, at the end of the march. Besides a few of my LA urban sketching buddies were on the march and when we get together, that’s what we do. We collectively choose to draw something “plein air” and then gather 1 hour or 1.5 hours later to share what we did and “geek out” over who has a great idea or material for sketching “on the fly.” That’s how I learned about keeping a sheet of bubble wrap in my small backpack. Sometimes I use it to level my watercolors, but most times I sit on it when perched on the cold, dirty and/or wet concrete or wooden bench. Oh yeah, sometimes I wrap up wet brushes or wet and paint soaked rags in the bubble wrap. I also have a quart-size zip lock bag of dry quinoa that I put under my paint trays to level them, otherwise the colors all run to one corner. So, then I began to think about how today’s post/blog and idea for art had changed and I realized how much my art had changed. When my son was young, 20 years ago, I was lucky if I could stop along a road and take a photo of something I wanted to paint or draw. 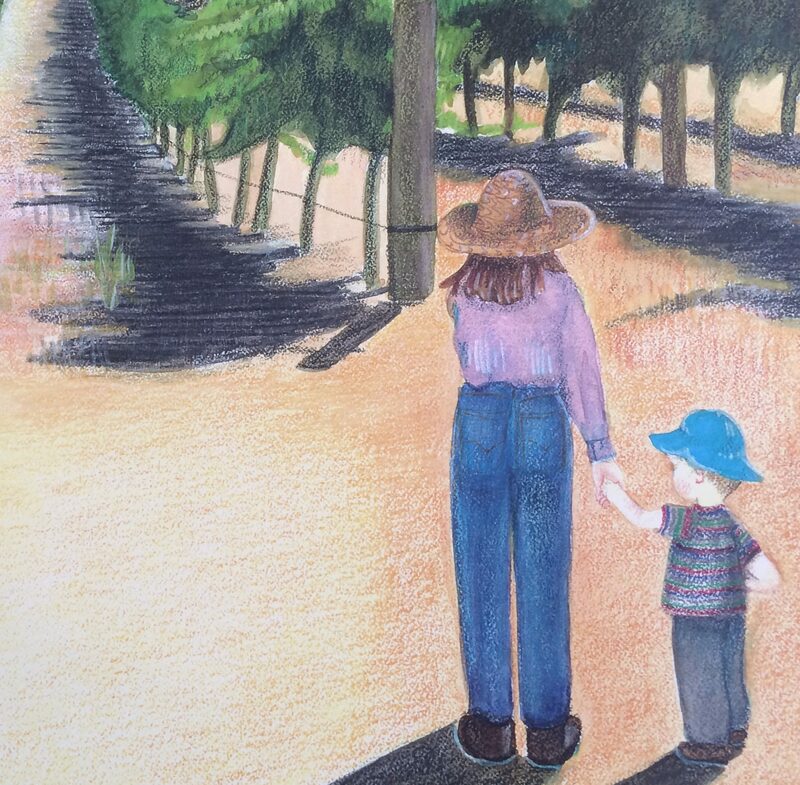 You see, as a single mom of a very active little boy, I didn’t have hours to sit “plein air” style in a vineyard, on a cliff next to the ocean, beside a maple with scarlet colored fall leaves or at the end of a “March for Science” event. I had to work at home and did oil on canvas, or watercolor and colored pencil on illustration board in 20 or 30 minute chunks of time at my easel or drafting table. During those years I took hundreds of photos, categorizing and sorting them by time of year and location. When I worked on an art piece I was vicariously transported to that place all over again. In fact many of my paintings had roads that I would imagine traveling down to take me to those places. The other part of my fantasy “plein air” painting time was the music I would play. My “go to” eclectic easel tunes included Miles Davis, Diana Krall, Mozart, Andre Previn’s jazz quartets, and 60’s Brazilian music—to name just a few musical inspirations. There were even times I listened to the Chieftains as I painted. So now I can really be in the moment and work as quickly or slowly as I wish. Of course now that I am outside more I have to figure out how to get everything I might want inside a backpack that doesn’t feel like I’m carrying wet cement. And the game becomes how to be smart about it and carry only the lightest and necessary materials—hence the bubble wrap and small bag of quinoa. Bottles of water can be heavy though and I am not always near a drinking fountain. But the other thing about being outside when I paint is dealing with the bugs and dirt that blow into the paint, as well as the bits of leaves or acorns that seem to drop out of the sky when a squirrel flicks something down from the branch of a tree I am sitting near. And sometimes I’m not a fan of the noise of other people’s children running around where I happen to be painting. I don’t think I miss my son being little either, but I guess I miss the art in Mozart. Note about California weather: If you do plan a trip to sunny southern California the month of June you may be disappointed in the weather then. The whole month is usually overcast and is referred to as “June Gloom.” Just sayin’. Northern California scenery also has a light and color story to tell. This piece of art was done on a beautiful early spring day in Grass Valley, at the foothills of the Sierra. Such a vision of complementary colors (on opposite sides of the color wheel) can be seen in early spring after the white blossoms have dropped off and blown away. What are left are these apricot colored “new growth” shiny leaves. And yes, the sky was that blue that day and the significance of these amazing colors being on the opposite sides of the color wheel means that such a contrast of color really “pops” in that California light. The French Impressionist painters would have loved to paint in the California light. Note about trees: I am obsessed with most kinds of trees—palm trees, oaks, ornamental pear trees, flowering cherry trees etc. I love the natural shapes, colors, and textures of most kinds of trees (not too crazy about some kinds of conifers though). However, I do not know why humans insist on trying to control the shape of some trees. Why would anyone “top” a liquidambar, magnolia or even a pine tree (kind of conifer), or “trim into submission” a sycamore or a colorful crape myrtle? I know of an editor at Southern Living that called it “crape murder.” I think I speak for the trees, and those of us who are obsessed with them, to just put down the trimmers and leave them alone. They have such a nice shape all on their own. This coming week is spring break for me and I plan to do a lot of sketching/painting. I have recently begun wandering the hills of Glendale, looking for opportunities to paint a quaint image of a house with trees, flowers and bushes, or just row upon row of palm trees. (My son says I am obsessed with palm trees. And so what if I am?) There are literally acres of palm-lined streets in this part of Southern California and I am in heaven. I also wander the paths between oaks, native California plants, roses and perennials at the Descanso Garden. I must admit I am drawn to the rose garden there. (My son hasn’t commented on that obsession yet.) I look for a shady spot, so my paints don’t dry out too quickly, and I begin to sketch. Then the paints come out and I start the layering of color. I’m not sure if I’ve really gotten the hang of this very temperamental media, but I do enjoy talking to the colors as I coax them from the cakes of my pallets into the mixing tray. I usually start with my deep blues like cobalt blue, ultramarine and Prussian blue. These help me immediately add dimension to my landscape—drawing my eye back into the shadows of a tree, shrub or into the baseline of a patch of flowers. Blue is kind of my “go to” color. I always try to have some kind of sky in the background too, and this is where I add my “cheeky” cerulean blue to the mix. The skies of California (in both northern and southern California) are often a haze of white on the horizon. Smog you say? Maybe, but I give that a pink (alzarin crimson) or aqua (sap green added to the cerulean) tint and all of a sudden I have romanticized a hazy sky of questionable content. And finally, there must be some white on the page as either a highlight or just because there should be some kind of reminder that there is paper underneath all that color. Obsession you say? But this is my little piece of the world and I can do what I wish! Isn’t that what we all do, really? We pick and choose people, jobs and of course food and fun, and then somehow we just mix that together to form a perfect afternoon of drinking and dancing. Right? Or maybe there’s an extra special moment at work where it all comes together and someone notices. Or just maybe you are in the right place at the right time and that perfect friend happens to be at the same garden at the exact moment, and you are both looking for the turtles that hide under the water lilies in the pond. And you know this is good because they listen to you talk about your painting obsession and are polite enough to let you finish and their eyes don’t glaze over while you seem to go on and on. Well, that’s at least how some of us do it in California. There are a lot of very creative people here, or maybe we are all just very patient as the stories drone on and on and on. So, the other day I had situated myself in a dark corner by the camellias at the Descanso Garden. Strangely enough I was not at any of my usual benches in the rose garden. I had begun mixing my colors and was happily chatting with the cobalt blue when a couple with their little boy of 3 or 4 stopped by. This little guy was running around the paths near me like he was on fire, and his dad was trying to catch him and put him out. I was unusually patient and didn’t really look up, except to notice them finally chase him out of this little part of my garden. I kept working for another 45 minutes or so and finally finished the painting I was working on. I was beginning to pack up to leave, when the little boy came walking towards me, holding his mother’s hand. He was very shy and his mom said that he wanted to come back and see what I had been painting. I showed him the trees, flowers and sky I had just finished and then we talked about our favorite colors and that we both really liked art and painting. (I didn’t tell him I talk to my paints as I mix colors.) The running would have probably commenced all over again and this time it would have been the mother running away from the obsessed painter. But I was impressed that the little boy wanted to come back to see me and that I had made a small friend at the Descanso Garden that day. That reminds me of the time I first brought out my watercolors when my son was 3 or 4 years old. He wanted to taste the different colors as he mixed them with water in the tray. And that of course is another California girl’s story. Up the hill to the Cayucos Morro Bay Cemetery–overlooking Highway 1 and a beach I frequented with my gold retriever and son when he was little. This is where 1.5 of my parent’s ashes is buried. I did a small watercolor of a Mariposa lily and placed it and the following edited note in their box in the columbarium that overlooks the site. June was a first generation Californian who was born in Los Angeles in the late 1920s, when Beverly Wilshire was a dirt road and Westwood (UCLA) was called Westwood Village. My mom’s family later moved and lived on Yosemite’s valley floor during World War II. My grandfather was the plumber for the Yosemite Park and Curry Co.
Before living in Yosemite my mom, her siblings and parents lived in Mariposa. During that time and in that place other family members also came to live. That included an assortment of aunts, uncles and cousins, as well as mom’s maternal grandmother. Mom graduated from Mariposa High School, with 17 other seniors, in the late 1940s. When my brothers and I were growing up she sometimes spoke of her life in rural Mariposa. As mom got older she frequently talked of buying back her family’s 80 acres so her children and grandchildren would have a “safe” place to go. She was convinced the world had gone insane and we all needed to go to Mariposa to “hide out” and live. Note: I haven’t yet taken her remaining ashes to Mariposa. She is in my closet. When I asked her which half (upper or lower, left side or right) of her she wanted with dad she said she didn’t care. Well, that was a blessing.